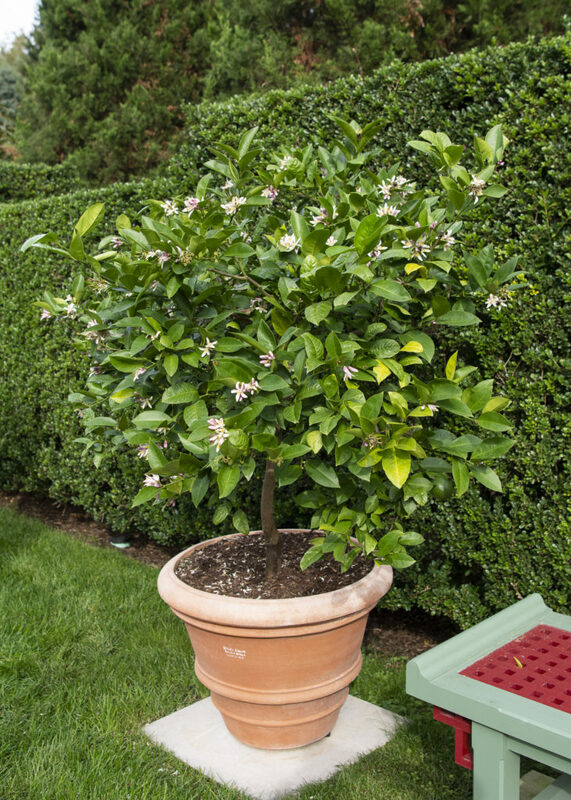 One of my first assignments as Horticulturist at Sleepy Cat Farm, nearly 10 years ago, was to acquire 8 Meyer Lemon trees for Italian terra cotta urns that would adorn the reflecting pool. Our greenhouse was up and running, so when the weather turned too cold, we moved them inside the temperate location over the winter. 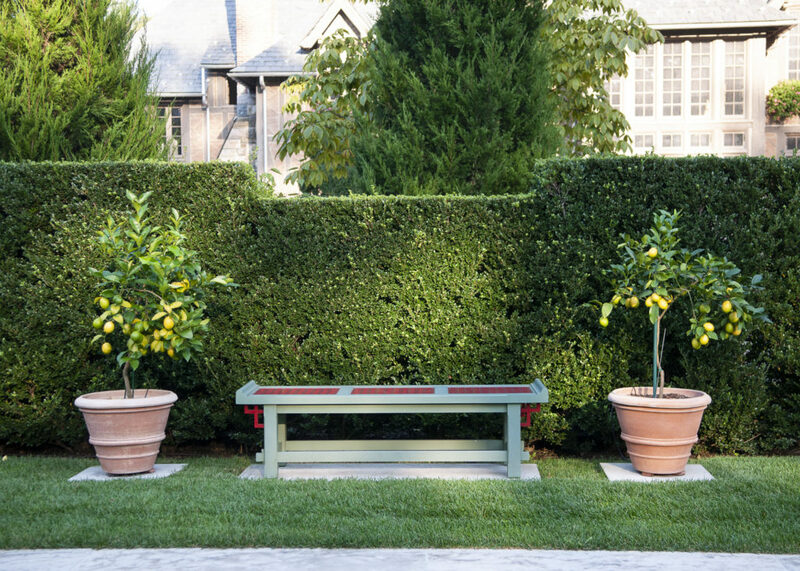 Meyer Lemons adorn the benches by the reflecting pool. Photo by Kathy Landman. During my first year at SCF, I received a call from The United States Department of Agriculture, saying that the trees I had obtained on the internet were from an area in Georgia that was quarantined and our trees would have to be destroyed. Shortly thereafter, an inspector arrived, cut the trees up and took them away. 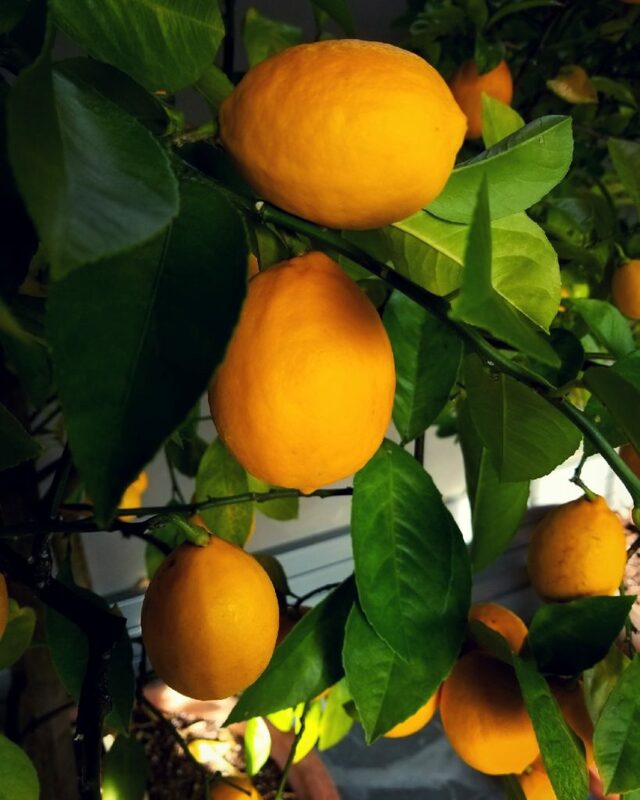 The company I had purchased them from was very efficient about replacing our trees with new, properly sourced trees, and nearly ten years later we have close to a dozen, large potted Meyer Lemon trees, each bearing more than 20 lemons per year. 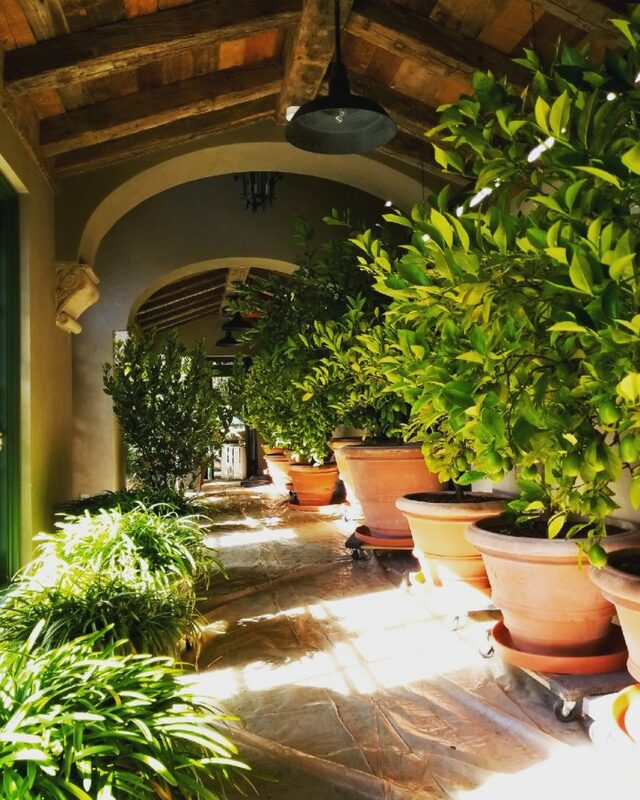 Meyer Lemon Trees wintering inside the “Limonaia”. 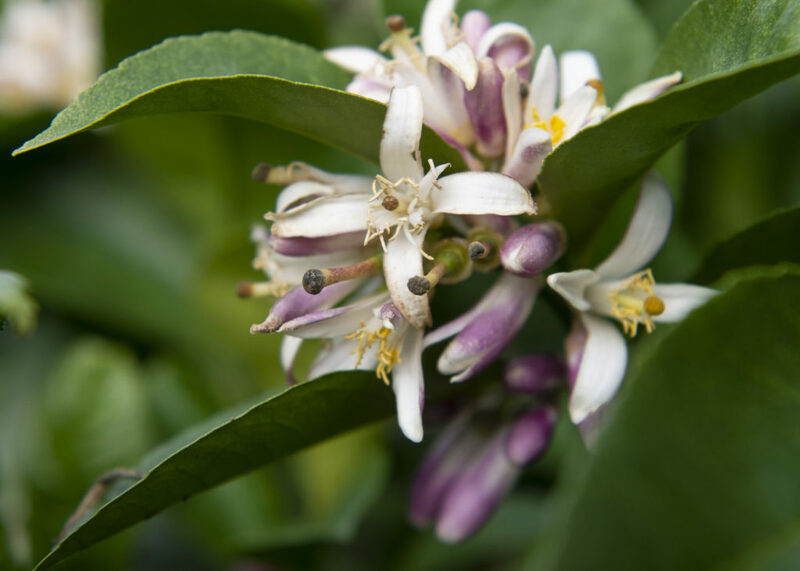 Though Meyer Lemons can withstand temperatures down into the thirties without damage, our trees needed a larger space than the greenhouse to winter, so their flower buds and new growth wouldn’t be injured. 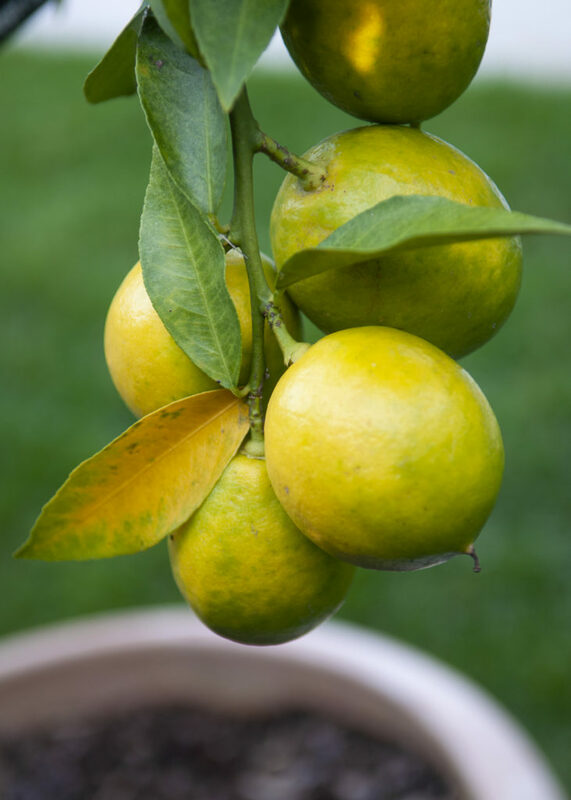 Sleepy Cat owner, Fred Landman, collaborated with architect, Charles Hilton, to come up with our “Limonaia”, an Italian inspired greenhouse for citrus plants, which serves the dual purpose of overwintering the Lemon trees, and providing a cool Summer room for gatherings when empty. The “Limonaia” faces south, and receives strong sun most of the day through its large windows. 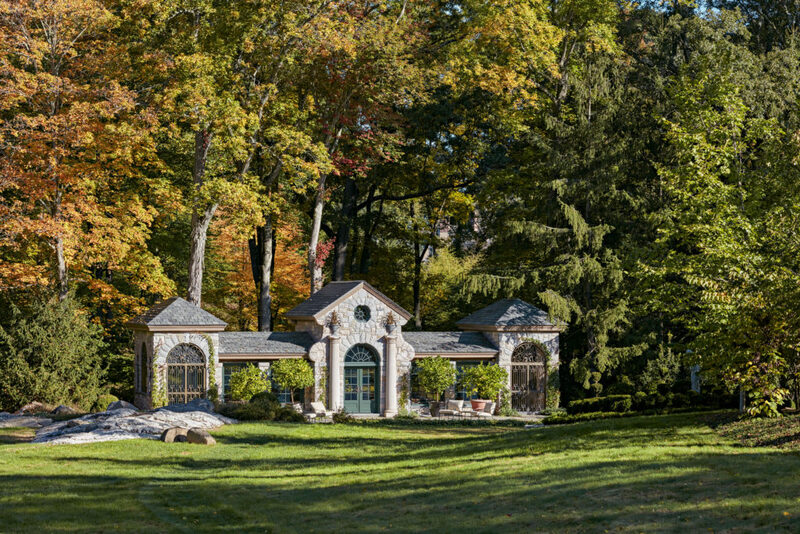 The stone rear wall retains heat, and minimal heating is required. Because Lemons require such high light, we supplement the trees with full spectrum grow lighting to promote flowering. A Meyer Lemon is a cross between a lemon and a Mandarin orange. 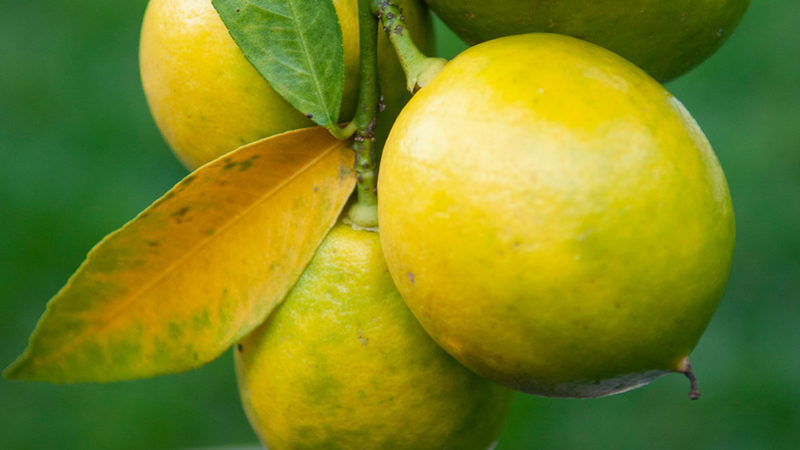 It has a thinner rind and is an edible, aromatic fruit, which is unlike your standard lemon. 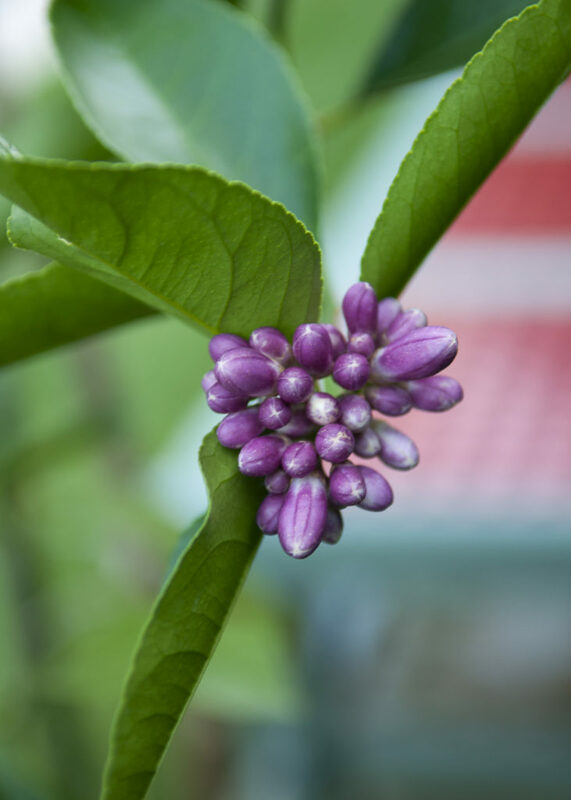 Although its exact parentage is unknown, Frank Meyer, an explorer for The United States Department of Agriculture, introduced a plant obtained on one of his expeditions to China in the early 1900s. He had seen the plant growing as potted specimens in yards of Chinese homes. These were the original Meyer Lemons, and thus, their true genetic identity cannot be determined. Typically, the trees begin flowering in February, and pollination occurs both indoors from the gentle fan breeze, as well as by insects, which continue pollinating the flowers later when trees are brought outdoors. Fruit continues to develop during the Summer, and ripens in late January. Once fruit is harvested, the plants are stimulated to begin flowering, which is when we begin feeding the trees. Citrus are very hungry feeders! 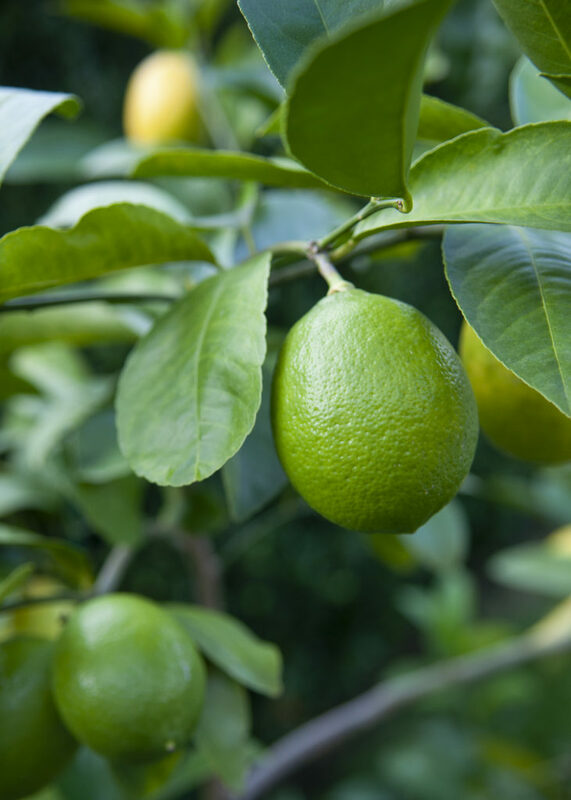 Like all plants, Meyer Lemon trees are susceptible to disease and pests including: Citrus scale, Mealybug and spider mites. During the period when the trees are outdoors, the elements and beneficial insects keep the insect populations below damaging levels. However, once we bring the trees indoors, none of these conditions exist, and insect populations skyrocket. Because we grow the trees organically, we rely on hand cleaning of the leaves alternating insecticidal soaps, isopropyl alcohol and neem oil sprays. This keeps the harmful insects at levels below the damage threshold. 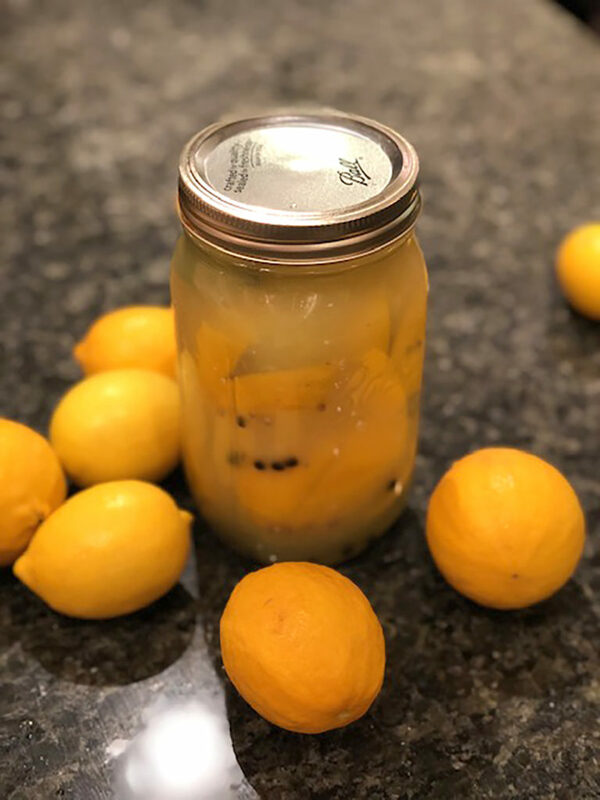 Meyer lemons are versatile and delicious. Enjoy them sliced very thin with shaved fennel for a quick salad or preserve some in salt. SCF owners, Fred and Seen, do this each year to have all season long. Use a quart size jar with wide mouth. Put 2 tablespoons of the salt in the jar. Quarter 6-7 lemons, about two-thirds of the way down, leaving the end intact. Open each lemon and put a generous pinch of the salt and spices inside and close. Pack lemons tightly in the jar, along with the remaining salt. Cover completely with additional lemon juice, making sure the lemons are submerged. Replace lid and keep on kitchen counter for a week. Gently shake the jar each day. Store in refrigerator for up to one year. 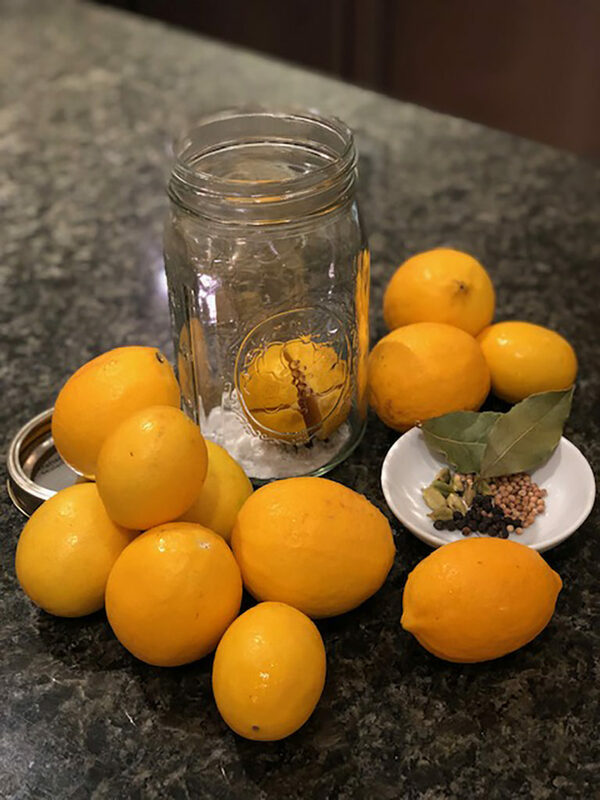 To utilize your preserved lemon, remove from jar and scrape away the flesh. Rinse lightly and the peel is ready to use. The brine is delicious for seasoning, just be careful as it will be quite salty. You can chop them up and add them to herb salsa for fish or chicken, add peels when braising chicken, lamb or vegetable, or use them as a garnish on top of vegetable soup or your favorite dip.